With New Years almost a month behind us (how is that even possible??? ), another holiday is fast-approaching: Valentine’s Day!!! For me, Valentine’s Day usually consists of hosting an Anti-Valentine’s Day dinner party with heart-shaped desserts and take out. And, of course, a Secret Valentine gift exchange. I find it quite easy when I draw the name of a female friend, but for male friends, and undoubtedly for boyfriends or other male significant others, it is much more difficult to pick out a present. Thus, I wanted to create this little gift guide to give you some inspiration. I know underwear is traditionally a female gift idea for Valentine’s Day but hear me out: Tommy John has the best mens underwear, undershirts, and socks, along with t-shirts and loungewear. The underwear comes in a variety of styles like boxer brief, trunk, square cut, brief, and boxer short, and is available in a number of colours (Valentine’s collection available February 2). I had never really thought mens fashion could be uncomfortable. I mean, women are the ones who wear dresses and high heels, but just picture a man trying to comfortable fit a pair of bulky boxers into a pair of skinny jeans. Not a pretty picture. All of Tommy John’s products are made with patented silky smooth and non-pilling fabric that is designed to stay in place when playing sports, working at the office, or lounging at home. With a best pair guarantee, 15% off upon subscribing to their mailing list, and free 3-day shipping upon spending $50 or more, Tommy John underwear and other items are definitely gift ideas I am going to hang on to. Warby Parker has so many colours and styles of sunglasses to pick from, that it should be easy to find a pair someone might like. I picked out the Preston sunglasses in Whiskey Tortoise because I think they are a great modern take on the traditional eyeframe shape, and apparently this style suits narrow faces, which tends to be difficult to find. All Warby Parker sunglasses have Akulon-coated screws to avoid those moments when your sunglasses break on vacation and you’re forced to resort to the old method of using your hand to shield your eyes from the sun. They are also cut from a single sheet of acetate so that the colour parity is consistent. I find this is really important with tortoise sunglasses because any changes in pattern or colour are really noticeable. And, you know, these sunglasses have 100% UV protection, which is always useful. So maybe your candle will be for a special someone and not your cat, but you get the idea . . .
More and more, candle companies are introducing new scents and packaging to appeal to the male demographic. Yankee Candles has such a wide variety of sizes and scents, and they now offer the option to create a personalized candle. Simply select your candle and fragrance, then upload a photo of you and your friend or significant other and customize the label. Some really nice scents for men are Balsam & Cedar, Sun & Sand, Black Cherry, and Midsummer’s Night, While I used a photo of my cat as an example, I think this would be such a cute idea if I draw the name of one of my male friends for this year’s Secret Valentine gift exchange because it is both memorable and useful. But act fast, because only orders placed before February 5th will be processed in time for Valentine’s Day!!! While selfies might be all the rage, so are the lesser termed “ussies.” You know, those photos you take with your significant other or a whole group of friends where one of you holds a camera way above your heads and you all squish together to fit into the frame. Or, now that I think about it, those photos approached civilly with one person simply holding out a selfie stick that could smack someone in the face at any moment. This photo album would make such a nice gift, especially if you gift it already filled with ussies. Finally, the classic mens gift: cologne. 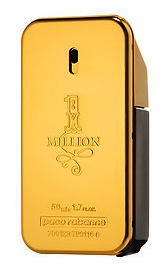 One of my favourite fragrances for men is Paco Rabanne’s 1 Million Eau de Toilette Spray. With grapefruit, mint, and blood mandarin among the scents included in this spray, I find it to be so fresh yet spicy, and long-lasting. Plus, this spray comes in three sizes (1.7 oz, 3.4 oz, and 6.8 oz) making it fit most budgets, and offering the chance to gift a new fragrance or an old favourite for at home or on-the-go use.